When I crashed my CBR recently, I wacked my helmet bloody hard on the bitumen. After a helmet takes such a big hit, you just never know if they are going to be cactus or not. I wasn’t taking any chances and decided it was time to replace my trusty Arai, sad times. When I saw the Kabuto FF-5V was going ridiculously cheap, I bit the bullet and picked one up. If you are looking for any motorcycle gear or parts, check out http://www.bikebandit.com. They have motorcycle helmets for sale, cheap motorcycle tires and OEM motorcycle parts. I’ve been browsing their site and found some cracker deals, especially if you are in the USA. By clicking on the links, you are also helping out OnTheBackWheel, so don’t be shy and get clicking! I can’t start this review without first mentioning the price of this helmet. I got my Kabuto for $150 AUD. You might be thinking, ‘yeah duh, thats because it’s a cheap shitta.’ Oh, but that’s where you are wrong. Once upon a time this helmet was $600 and marketed as Kabuto’s top of the line race helmet. Even though the design is a few years old now, they are of a MUCH higher quality than a current cheap helmet. Picking up the helmet, it’s clear to see that the build quality is good. Would I put it on par with Arai, Shoei or the other big names? I’d say it’s close enough that I’m not willing to say one is better than the other. The lining, paint, fit and overall finish is great. I’m not a huge fan of the paint design, but you can’t have everything for 150 bucks! A mean looking helmet, but the design won’t be for everyone. Every Fred has a different head, but for me, the fit is good. I tried on the large and found it extremely comfortable, but the teeny, tiniest bit loose. The medium on the other hand was much tighter than I’d usually like. If I was only using this on the street, I would have grabbed the large without hesitation. I went the medium with the hope it would loosen up a little over time, because hey, $150! After having the helmet for a couple of months, it’s still bloody tight! The first couple of weeks I had it, I was worried. The helmet felt too tight, but it has loosened up a tiny bit and I’m pretty happy with it now. I’d much rather have the helmet that’s tighter instead of loose, especially since I’m going to be using it on the track. Here’s hoping the Kabuto has a little more give in it over time. The lining of the helmet is made of a delicious material that is soft and comfortable. The lining can make or break a helmet for me, so kudos to Kabuto here. The shape of the helmet is neutral. I’d liken it to an Arai, which is great because they always fit me perfectly. The visor mechanism is your standard design that opens at designated angles. It works fine, but I find the smallest opening is too open and directs air straight onto my eyes. If you try to put it any smaller it snaps shut. While Arai’s visor system is a pain, it is unbeatable in that it allows infinite opening angles. Other brands need to follow suit in this regard. The bubbles on the visor is from the installed pin-lock. I am happy to report that the visor removal system is brilliant in its simplicity. To remove the visor, it’s as easy as pressing a button on the side and then sliding the visor. It’s a great system. Yes, I know you don’t change the visor often, but after breaking Arai mounts with their retarded system, it makes for a pleasant experience. The FF-5V is light to pick up and light to wear. Moving your head around while riding is easy and it isn’t affected by wind. A small feature I like that may sound stupid is the strap clip. The button hangs a little bit lower than other helmets which makes it very easy to clip onto, especially when wearing gloves. There are some things I don’t like. My main bug bear is a lot of wind comes up under the chin of the helmet even with the chin mesh installed. This probably won’t be an issue on a fared bike (I’ll let you guys know once I’ve used it on my track bike), but on my Tuono it’s very noticeable at high speeds or in cold weather. I ride almost daily in the dark, and on these colder winter nights it has been making my eyes water and is just downright unpleasant. Overall the vents work fine, but the vents on the top are way too small and I struggle to find them. The chin vent is easy to use but I can’t tell if it’s open or closed most of the time. I also find sometimes it will slide itself the wrong way on me. If you are like me and wear in-ear plugs while riding, the FF-5V has quite a small opening so the plugs frequently get caught when taking the helmet off. I know its minor, but it’s surprisingly painful! Noise levels, I’d say the Kabuto is neither quiet nor loud. There are times when the helmet produces wind buffeting at different head heights which my Arai’s haven’t done. The only other fault I can find, and it’s more of a nit-pick, is with the pin lock. The pin lock does a top-notch job of reducing fog, but the top sits in the peripheral of your eye line. I’ve tried putting my helmet in slightly different positions but it’s still there. I will try remounting the pin lock in a higher position and see if that makes a difference, but I think it’s just going to be one of those things. If you can get this helmet for $150, buy it, it’s a bloody bargain. For those who haven’t used Kabuto, having looked at the current models and now having owned one, I’d put them in the same quality bracket as all the other big brands. I use mine every day and have had no problems. Be wary that this a track orientated helmet so the fit is snug and it has a small opening. 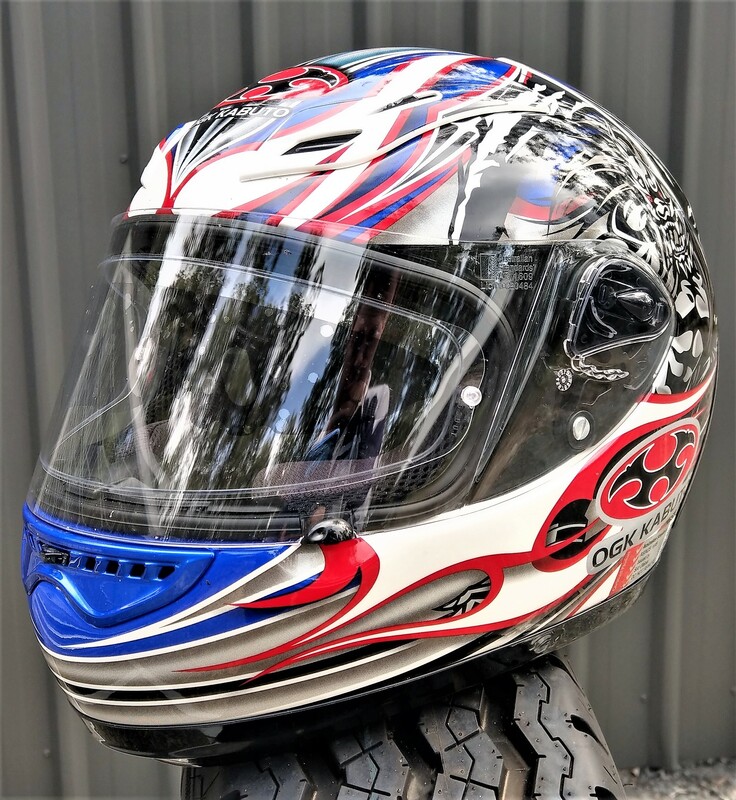 Overall though its light, has good build quality and to put simply, you’d be mad to get a ‘cheap’ helmet if you can pick one of these up for $150. If it was more expensive or at full price I’d look elsewhere. For its full price you can get a much newer and modern helmet without the failings of this helmet. Any questions about the helmet, don’t be afraid to ask. In the mean time, keep it OnTheBackWheel people! Previous Shark Leathers Velocity Suit Review – Great price, Great product?